Geneva/Pretoria, 28 November 2016– Representatives from national governments in Africa, Asia and South America as well as international organizations were back in South Africa last week for a workshop on CITES and livelihoods just one month after the World Wildlife Conference – the 17th meeting of the Conference of the Parties to CITES (CoP17), held in Johannesburg. Representatives discussed CITES and livelihoods issues and the implementation of relevant CoP17 decisions. The workshop was co-organized by the CITES Secretariat and the Department of Environmental Affairs of South Africa. In addition to the discussions on the implementation of CoP17 decisions, participants also shared their unique experiences on a wide range of subjects, from artificial propagation of CITES-listed plants and livelihoods of rural communities, the sharing of tourism revenue with communities as an incentive for conservation, the determinants of sustainable sourcing and livelihood benefits of the wildlife trade, to vicuñas and livelihoods of the High Andean people in Peru, the bushmeat case study in Colombia, case studies on Cocodrylus acutus and hammerhead shark and current initiatives of IUCN and linkages with CITES processes. The workshop also addressed funding needs, the mandate of the future working group of the Standing Committee on CITES and livelihoods, the support needed by rural communities to benefit from legal and sustainable trade in wildlife, the criteria to determine a successful CITES and livelihoods experience and best practices and future case studies. Following the example of previous workshops on CITES and livelihoods, the host country organized a field visit to give participants an opportunity to observe first-hand how rural communities benefit from legal and sustainable trade in CITES-listed species. 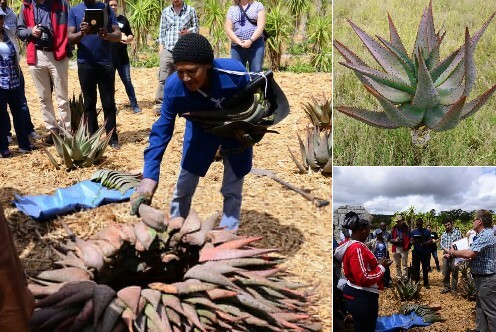 The field visit showcased the role of Aloe ferox, a CITES Appendix II plant species used for medicinal and cosmetic purposes, in engaging and benefiting local and rural communities. The tour covered the whole production and value chain from growers and tappers, processors of Aloe ferox, to manufacturing facilities and retail shops in a local close the George, the venue of the workshop. It is worth noting that it was in fact a proposal at CoP11 in 2000 to include Harpagophytum (Devil's claw), a genus of medicinal plants found in southern Africa, that started the CITES and livelihoods process due to concerns on the impact of the CITES listing on rural communities. As with Aloe ferox, there is a big international market for medicinal products of Devil's claw. Parties at the George workshop agreed to submit a report to the next meeting of the CITES Standing Committee to be held in Geneva next year on the outcomes of the workshop, including some concrete recommendations to keep up the current momentum and to move the work forward. The first CITES and livelihoods workshop was held 10 years ago in South Africa to bring into operation of a CoP13 decision. The workshop held in George, South Africa marked the 10th anniversary.